Integrating a modern shopping center with a 19th century building is a great idea. It is exactly what the guys at the Melbourne Central shopping center (Australia) have done! It makes it very different to the numerous shopping malls in and around Dubai where unfortunately history is not part of the game... One exception where at least they tried, is the Ibn Batutta shopping mall at the West part of Dubai. On the North side of the Melbourne CBD (Central Business District) one can find the Lead and Shot factory tower. It is a 50m brick tower (completed in 1890) which has been used to make 6 tons of lead shots (i.e. bullets) per week until 1961. 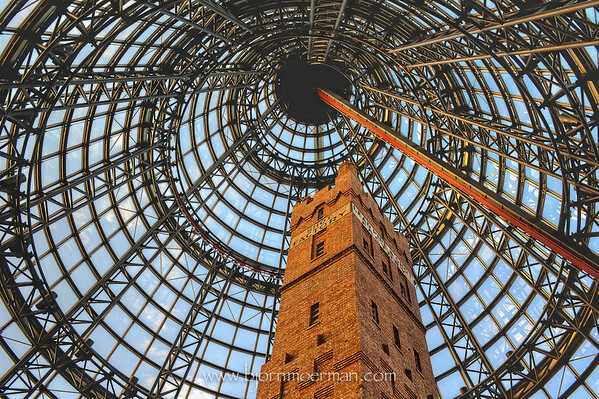 The building was saved from demolition in 1973 and was incorporated in the large Melbourne Central complex underneath a 84m high conical glass roof, in 1991. The bullets were made by dropping small lumps of molten lead form the top of the building. By the time they reached the bottom, they had cooled and solidified into shot pellets. Individual shots were then checked for size and roundness and were remelted and dropped if not passed by quality control. More images of the capital of Victoria can be found here. Earlier this week I had planned to pick up an Apple iPad in Munich. The very popular 64GB 3G tablet device was out of stock and I came home with a 27 inch iMac i5 instead. The high end iMac machine had been on my radar for a while. Until a few days ago my main photography editing machine was running Windows VISTA.Needless to say this is not the most stable system around. After I bought my first Mac, a 13 inch Macbook and an iPhone 3GS, I realized that one day I would become a Mac only guy. That day has now come and I surely won't be looking back! 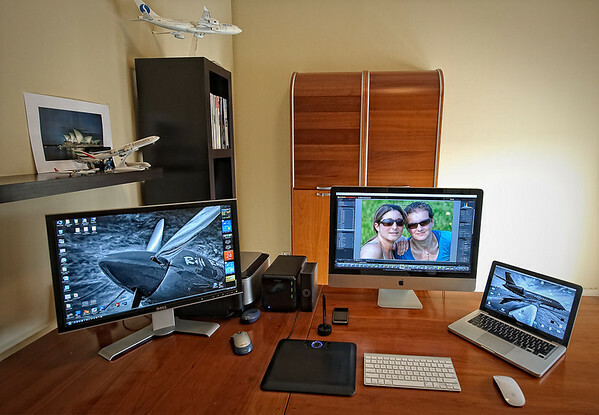 Due to wide-angle lens used, the monitor on the left, my old 24 inch DELL, looks larger than my brand-new 27 inch iMac. Right now, I'm not sure what'll do with the monitor. I've been very happy with it but really do not need the extra screen real estate. The 27 inch iMac screen has a whopping 2560x1440 pixels resolution. The setup really looks promising! 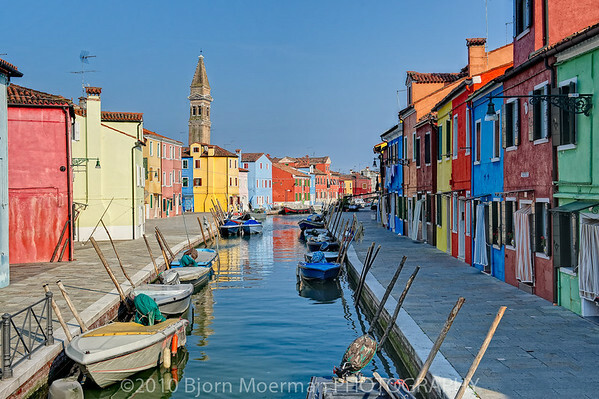 Without doubt, the Venice area remains one of my European travel photography favorites. Even though I've visited the island multiple times (more than 10), there is always something to shoot at the "Queen of the Adriatic". I tend to concentrate on the other parts of Venice and its surrounding islands. 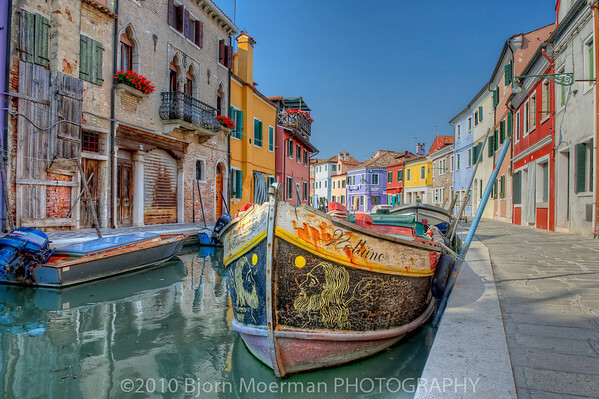 On my last visit I went out to the island of Burano. A very pretty island in the Northern part of the Venetian lagoon, about 45min to 1 hour away by Vaporetta, call it a water-bus. 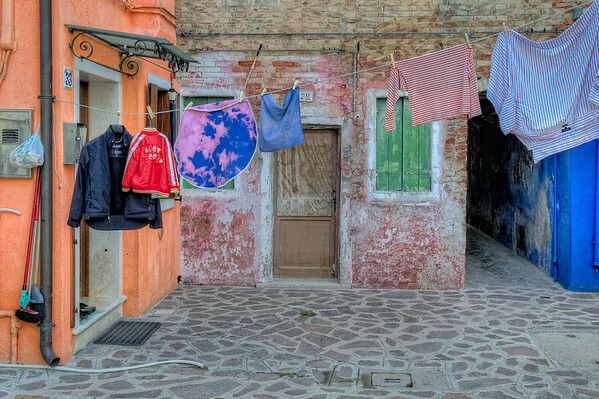 The fishermen's island which is often mistaken with Murano (glass making island), is further out at sea and is therefore far less invaded by tourists and the like... Its pastel colored houses makes it much prettier than Murano. A photographers paradise! While the fishermen were out at sea, their wife's would traditionally sit outside and make lace. 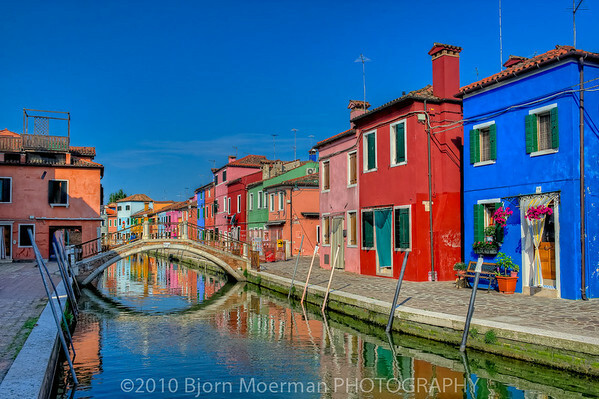 Something else, Burano is known for. Even though the island is not that large, one can easily spend a full afternoon and wander around to discover interesting photographic opportunities like this. On the way back to Venice, I passed by the ruins of the island of Madonna del Monte which was bathing in wonderful late evening sunset light. 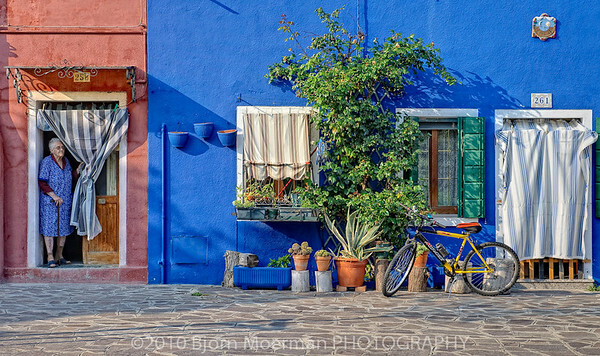 More Burano and other Venice images can be found here. Pic(k) of the week 24: Free like a bird ! Somewhat jet-lagged, I'm back in Dubai after a quick visit to Brisbane. Earlier this week my day job as an airline captain, took me to the capital of the Australian state Queensland, where I also attended the yearly World Press Photo 2010 exhibition. Because I hadn't planned any specific photography for the trip, I decided to travel light. My Nikon D700 with a 50mm 1.8 prime did the job. 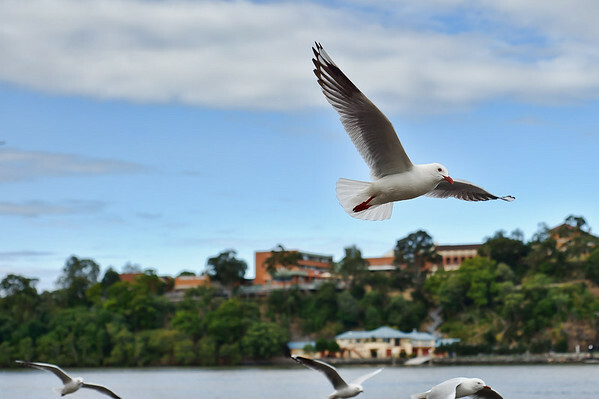 On the way to the Brisbane Powerhouse (where the World Press Photo exhibit is held), I made this image of some seagulls flying by. Beside being a Pic(k) of the week, it also has made it into my Gulls gallery. Some more images shot in Brisbane can be found here. During my last visit to Belgium, I tried documenting life around the Port of Ghent, Belgium's third largest port after Antwerp and Zeebrugge. The port connects to the North Sea, through the Western Scheldt and the Ghent-Terneuzen canal. I didn't want to do a classic big boat shoot but concentrated more on details and live around the port, going around like an urban explorer. Railways criss cross through the Port grounds. This train was waiting to be loaded at the Van Heyghen Recycling. Beside recycling all kinds of metal like cars, the company also dismantles large ships like the "City of Berytus", a large cargo ship used to transport cars, which caught fire end of 2009 in the Port of Antwerp. The dismantling is done in layers while the ship is still in the water. Above is a detailed shot of the main propeller of the +1500 ton giant. One of the highlights of the afternoon shoot was the disused concrete factory, "Inter-beton". There is some great graffiti art at the site! A mecca for HDR and urban decay photography! Even though one can easily go inside the building, you'll need to be very careful and preferably not go solo! I'm not totally sure what will happen to the factory... Quite a few old hangars and buildings are excellent candidates for LOFT living. Another place we visited was the development of "Loods 22" (Hangar 22). One of 5 hangars built between 1885 and 1900 which was used to store cotton that arrived by ship from all over the world. Hence street names in the neighborhood like America and Africa avenue. Two of the cranes used to unload the goods have been restored to their original condition and a developer is now selling casco Lofts on site. Beside the original 22 building, a second building has also been cleaned up and it looks like it will eventually also be sold as office space and/or lofts. An excellent idea and a great way of living if you ask me! Last but not least, a great thank you to the person that organized the Port of Ghent photography authorization letter ...You know who you are! All of the Port of Ghent images can be found here. Pic(k) of the week 23: Summer "Knotwilg Avenue"
Those of you who have been following my Personal Project, "Pic(k) of the week, might remember my first pic(k) early January 2010. Last week on a very nice early summer day, I happened to be back at the same place. The outside air temperature was more than 30°C warmer than 6 months ago. I've always found it interesting to revisit a place during different seasons. Yes, seasons, is something I surely miss living in the desert! To see the original "Knotwilg Avenue" image click here. The Knotwilg tree is very common in the low countries (Belgium, Netherlands) and can most of the time be found near little water streams. I'm still editing some of the images shot in Belgium last week, as well as an interesting collection shot on the island of Burano (near Venice) 2 days ago...More to come in the next few days! I'm writing todays blogpost from my home-country without government, Belgium. I've planned to do some photography during my 10-day stay, including an upcoming shoot at the sea port of Ghent next Thursday. Off, I went to 2 of my local churches to shoot some dramatic interior HDR images. Just behind our apartment in Harelbeke (next to Kortrijk) is the "Modern" 1960's Sint-Rita church. I had never been inside the place of worship built by one of the leading Architects of Modernism in Belgium, Leon Stijnen . Shame on me, since it really is worth a visit! if you haven't done so yet, please consider joining my Facebook page by clicking here.